Please read this great article about a talk given by Former President Bill Clinton at the Masimo Patient Safety Science and Technology Summit, this past January in Orange County, California. The underlying message and core philosophy in President Clinton’s speech mirrors mine exactly! Simply put, through the “smart” implementation of technology in medicine we really can ELIMINATE the 200,000 tragic deaths, like my beautiful daughter Emily’s, that occur every year as a result of preventable medical errors. The main goal of the conference that former President Clinton took part in was to get manufacturers and developers of health monitoring devices to share information with one another in an effort to reduce unnecessary patient deaths in the United States. One of my favorite lines from his speech was as follows, “There need be no evildoers in this story. There’s just human nature and the nature of human development. Institutions have become ossified and rigid… where position is more important than purpose, or people get overwhelmed by complexity.” Because of this conference 8 major medical device manufacturers agreed to share data. This is a breakthrough we can all be excited about! Read the whole story on the San Clemente Patch website by clicking here. I came across a great article recently in the News-Herald, a small newspaper that serves Northeast Ohio. David Lynch, former mayor of Euclid, Ohio, wrote a touching piece on forgiveness and referenced my reunion and public forgiveness of Eric Cropp (the pharmacist responsible for Emily’s fatal dose), which can be viewed in the sidebar of our site. He holds me up as an example others can strive for when thinking of forgiveness in their own lives. I am humbled and honored to have touched him and inspired the article. Please read it when you get a chance by clicking on the scanned image below. Traveling to New Mexico to Find out Why New Mexico State Pharmacy Board Member Was a “Driving Force” in Getting Pharmacy Technician Ratio Eliminated, Putting Tens of Thousands of Residents at Risk for Medication Errors! CLEVELAND, OHIO- Last week, it was brought to my attention by a number of concerned pharmacists from the state of New Mexico that their state was now one of the few states in our nation to recently eliminate their pharmacy technician ratio mandate. If I understand correctly, under the new terms, the pharmacy technician ratio will now be determined by the pharmacist-in-charge (PIC). With this particular scenario, my primary concern from a patient safety standpoint is shared with many pharmacists themselves around the nation. It is NOT that the pharmacists themselves are not capable of making this very important determination. It’s quite the contrary, pharmacists are very qualified to determine safe ratios in their pharmacies. The primary concern, lies in the fact that in retail pharmacy especially, the large retail pharmacy chains treat their pharmacy workflow in their retail pharmacies too much as a volume based production line. With that type of mentality, through the corporate policies and procedures they implement, they put their core emphasis on quantity over quality, often at the expense of their customer’s safety. With that being said, my trepidation is due to the fact that pharmacy technician ratios are so closely tied to retail pharmacy’s PROFITS that the large retail pharmacy chains like Walgreens, CVS, Rite-Aid, etc., will now start to dictate and put pressure on their pharmacists in New Mexico to staff their pharmacies with as many pharmacy technicians as they so choose, throwing customer safety by the wayside, in an effort to maximize their profits. With that in mind, if a pharmacist employed by one of these large retail chains refuses to sign off on, or approve, a ratio in their pharmacy that they feel is clearly unsafe, the retail pharmacy will simply tell them to resign and find another job elsewhere. As I have mentioned many times previously, the primary mission of any state board of pharmacy, is to protect the resident’s of their state from unsafe pharmacy practices. It is not clear to me how the New Mexico State Board of Pharmacy’s recent approval of the elimination of their pharmacy technician ratio will improve the safety, or benefit the residents of their state in any way, whatsoever. Again, the only people that stand to benefit from the elimination of the pharmacy technician ratio are the large retail pharmacy chains, as well as, the owners of the small independent retail pharmacies in New Mexico. They stand to benefit greatly by substantially increasing their PROFITS by now being able to legally staff their retail pharmacies with as many low cost, hourly, pharmacy technicians as they want, while simultaneously, lowering the number of registered pharmacists supervising and double checking these technicians work. Furthermore, by increasing the number of pharmacy technicians in any given pharmacy, you increase the overall number and volume of prescriptions that must be checked by the supervising pharmacist, thus, increasing the probability for “human error” and subsequent medication errors with catastrophic results. The following are just a few very relevant and well publicized pharmacy technician errors that really hit home with me, as I was lobbying in opposition of Senate Bill 818 in Florida earlier this year. 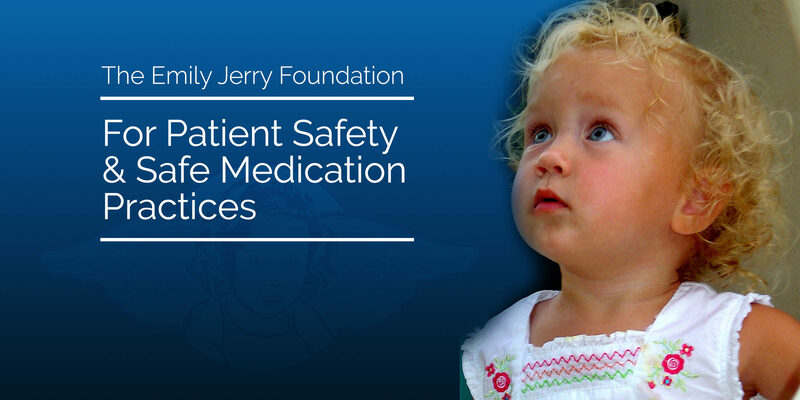 As everyone is probably already aware, The Emily Jerry Foundation has been working very closely with several experts in safe pharmacy practice, the American Society for Health System Pharmacists (ASHP), the Institute of Safe Medication Practices (ISMP), and numerous state boards of pharmacy all over the United States, to keep the large retail pharmacy giants from lobbying to increase pharmacy technician ratios. Having worked so closely with these pharmacy professionals over the past few years, I have learned that the only reason the retail pharmacy chains lobby so hard to increase the ratios, or eliminate them entirely, is because it is in the best interest of improving their profits. When profit maximization strategies by retail pharmacy come at the expense of overall customer safety, I find it quite appalling! What I found even more disturbing was learning that a New Mexico State Pharmacy Board member, Danny Cross, may have been a “driving force” behind the elimination of the pharmacy technician ratio in New Mexico. This is alarming, if true, given the potential conflict of interest, given that Mr. Cross is the owner of a retail pharmacy establishment called Southwest Pharmacy in Carlsbad, New Mexico. I have made flight arrangements and will be departing for New Mexico on Wednesday, June 19th. During this trip, I have meetings scheduled with Larry Lorens, the Executive Director of the New Mexico State Pharmacy Board and will be attending their meeting on Thursday, June 20th, which I found it ironic that The Emily Jerry Foundation was already on their agenda (click here to see the agenda, particularly section 12c). Also, during my trip, I hope to meet with the Governor, Susana Martinez, to discuss this very important issue and will also be trying to schedule a meeting with Danny Cross to discuss the underlying logic behind this ludicrous decision to eliminate the pharmacy technician ratio. I am extremely concerned about the safety of the residents of the state of New Mexico and will be doing everything I possibly can, with respect to my advocacy efforts and those of The Emily Jerry Foundation, to get their pharmacy technician ratios, not only reinstated, but lowered in their state.